We knew the moment we made the decision to travel to Iceland that we would hire a campervan. As regular travellers in motorhomes throughout Europe, and now the owners of our own camper, there was never going to be another choice. This article is to provide you with some insight on the hiring process and what you actually get for your money. Hiring a campervan in Iceland is not as cheap as you might expect. In fact, it’s the most expensive I’ve ever hired. However, it can still be cheaper than hiring a car and staying in hotels and as I mentioned earlier, the key benefit for us is keeping our independence. After thoroughly researching campervan companies in Iceland (of which there are many), we decided to hire our campervan through Car Rentals in Iceland. They have partnership arrangements with many of the car and campervan hire companies in Iceland. This means you will have a variety of options at your fingertips and the ability to choose the right vehicle for you. The team at Car Rentals in Iceland are great communicators. Confidence in who I am dealing with when handing over large sums of money is very important to me, so having timely communication was appreciated. Our vehicle came from CampEasy Iceland. The actual selection of the vehicle is easy. Simply choose the vehicle you wish to rent and complete the booking process. You will be asked to pay a deposit upon booking and also provide your driver’s licence details. CampEasy offers many add on accessories which you can elect to book online at the time of booking or purchase at the depot. The list of accessories is extremely comprehensive and can really complement your trip. Before securing your booking it’s a very good idea to ensure you understand what is (and isn’t) included in your hire cost. Check that your mileage is unlimited. Whilst Iceland isn’t the biggest country around, you’ll still clock up high mileage. In eight days, we drove 1,943km as we circumnavigated the Ring Road and various other offshoot locations. Insurance is also usually an item that catches out a lot of people. Is it included? If so, what exactly are you insured for? Iceland has an often-times confusing array of insurance options and it’s important you have insured yourself adequately. This can be done through the hiring company or your own personal travel insurance. Which campervan should I hire in Iceland? 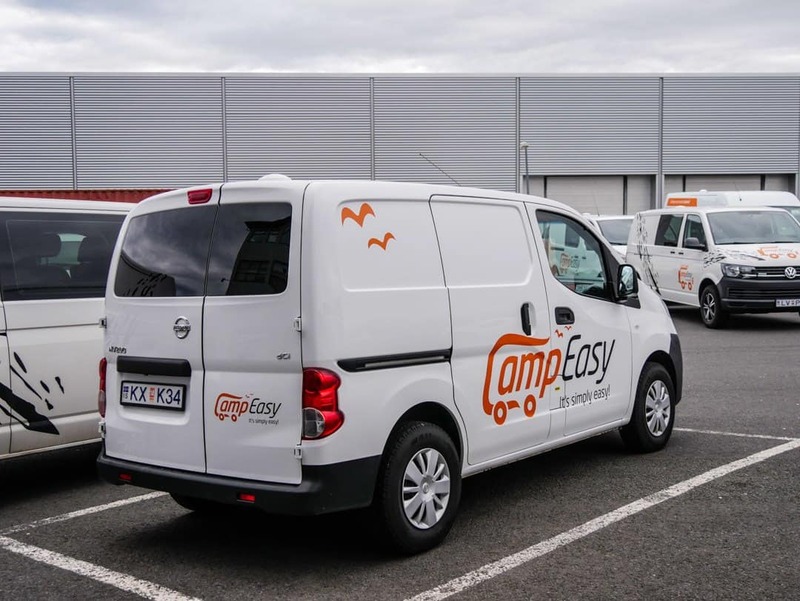 CampEasy has a range of vehicles to choose from including those small enough for two people right through to groups of five. They come in manual, automatic and also 4×4 campervans. Choosing the type of car is the most critical aspect of the hiring process. Depending on the season, you will need to consider road and general weather conditions and road access. Iceland has what are known as F roads which are only accessible at certain times of the year, and only by 4×4 vehicles. If you are planning on driving these roads, hiring a 4×4 is a must. Significant penalties apply for driving non-approved vehicles on F roads. It’s also a very silly thing to do from a safety perspective. By the same token, hiring a 4×4 campervan when the roads are not accessible or if your itinerary doesn’t include them is just a waste of money as they are more expensive to hire than a regular vehicle. Most of the vehicles have the same inclusions. The size and functionality of them are the main differences. This vehicle below is the smallest of the fleet, the EasySmall. We had the automatic 4×4, slightly larger version called the EasyFun. With side windows to let more light in and a slightly longer rear, it just provided us with a little more room to move. CampEasy, where our campervan came from (via the Car Rentals in Iceland portal), is located just outside of Reykjavik city centre. Upon booking, they will send you a Flybus ticket to get from Keflavik Airport to the bus station. They will then send a shuttle bus, like the one below, to pick you up and take you to their depot. Or, like us, they will pick you up from a central hotel or apartment. All of this makes the initial hiring process very streamlined and hassle-free. Always a good start to any road trip! Be sure to ask if your campervan hire company in Iceland has a similar arrangement. Once at the depot a member of the CampEasy team completed our hire. This involved taking copies of our identification documents, credit card imprints and finalising any arrangements for extras, insurance, drop off times etc. The staff member took us through a very thorough briefing on how the car operates, what to look out for on the roads, insurances and general driving and road tips. They also provided us with several important websites and apps so that we could check on the weather. It might sound like overkill, but the weather can change quite quickly here and it pays to be prepared. They will also advise what to do in the case of an accident. Before accepting responsibility for the vehicle ensure you conduct a thorough inspection, asking for any damage to be noted on the rental agreement condition report. This rental company was very clear on the type of damage that could occur and what the cost would be if it happened whilst we were in the hiring period. Take photos of everything! Every scratch, dint or mark should be captured on camera. Check underneath the car, check the roof. It’s your protection against any issues upon returning the campervan. People at the depot might think we go overboard, and quite often they will say “don’t worry about that”. Actually, you need to worry about that. Often times, the person who checked our your campervan hire is not the same person who checks you back in. They all treat damage differently. Protect yourself, and get everything recorded on the contract and with your photos. Costs for damage are high in Iceland and there are many factors outside your control that can cause even minor damage. A wonderful recycling process operates at CampEasy. Part money-saver, part recycling, some shelves have been built inside their office to allow campers to share and trade goods that they have left after their trip. Here you can pick up a can of soup, pasta, sauces, toilet paper, paper towel, jams and other spreads and a whole range of non-perishable items. At the end of your trip, you simply return the favour and leave your leftovers here for the next person to use. I’ve been at campgrounds before where this kind of action has been informal, but to see it as a dedicated part of their hire program is just terrific. We loved the EasyFun! An easy to drive campervan, with comfortable interiors make driving these roads a simple task. The front cabin has good air conditioning, not that I recall using it other than to test! On the flip side, the heating is good to warm you up quickly after being on the outside. There is reasonable space in the cabin for books, gadgets, cameras and other bits and pieces you might be carrying. Unfortunately, you can’t move from the front of the cabin to the back, which I found annoying. This is due to the kitchen cabinet being built across the back of the front seats. There is one 12-volt socket in the front cabin to charge devices. Another 12-volt access point is located on the front side of the kitchen cabinet. This is ok for when you are sitting in the back and wanting to charge but annoying when you want to use it whilst driving. Most of the cables for the devices aren’t very long so I found it difficult to have them charging there and still be able to use them in the front. There are more out the back which again I found annoying as they aren’t easy to access when you are driving. We always take a couple of extra adaptors when we hire campervans or motorhomes so that we can charge as many of our ddevicesas possible at once. How much space is inside the campervan? This isn’t the penthouse but it was more than suitable for a short eight-day trip. Velvet covered foam seating is available in a U shape configuration, with a central dining table. The two of us could easily stretch out along each side or sit comfortably at the table to eat, work or read. We elected to keep the table in place but if space is at a premium, it can be easily dismantled and stored during the day. Good storage is provided underneath both of the side seats. The base of the seat simply lifts up, providing access to a large open area. It’s great for storing shoes, backpacks, photographic and electrical equipment and clothes. It’s a great spot for keeping valuables out of sight too. At night, the seat backs that hang on the wall during the day come down and are placed on metal supports that run across the cavity from left to right. The table is removed at this stage also. This, in turn, creates a full-size bed that spans right across the entire width of the vehicle. It was more than enough room for the two of us. Grey curtains cover all glass windows but in the middle of summer, when the sun never sets, they only dull the daylight a little inside the van. If you are unable to sleep unless it’s pitch black, I’d recommend packing an eye mask. Even so, this doesn’t really prepare you for going outside at 3 am and being blinded by daylight. It’s still something I find totally weird! The kitchen is really a cabinet, purpose built at the rear of the front cabin. In a limited space, it serves its purpose well and provides the necessities for life on the road. The sink system is relatively primitive, hooked up to a 20-litre water container at the side, but at least there is a tap for running water. Several drawers contain the cookware and kitchenware and there’s available room for storage here also. 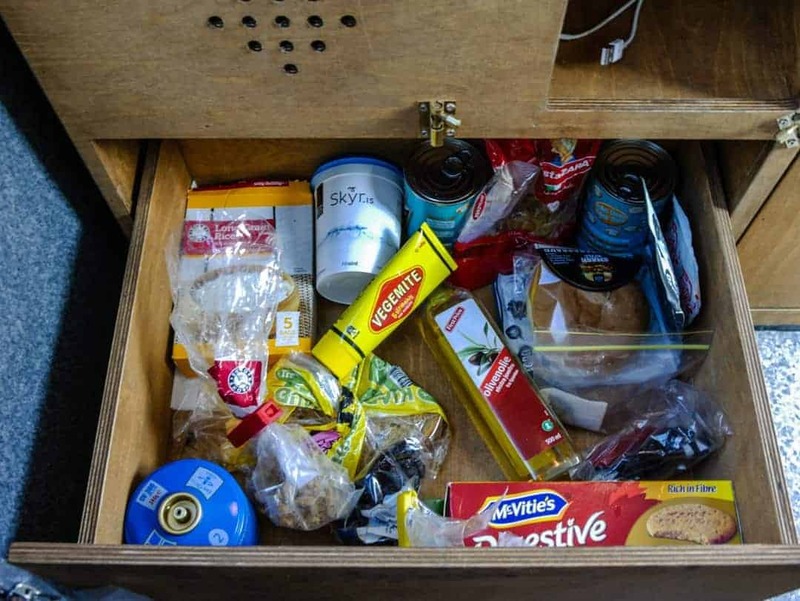 We used one for easy access to our toiletries, devices and chargers and another for our dry pantry items. A one pot gas cooker is also provided. Depending on the weather you can either set it up outside or on the benchtop. Extra gas can be purchased from the hire company. I highly recommend this as there are limited opportunities to purchase this elsewhere. If you don’t use the gas you get it refunded upon your return to the depot. A Waeco thermo cooler is provided as the fridge but it’s important to understand this isn’t really a fridge. It’s the one thing that I absolutely hated in this vehicle and it’s turned me off Waeco for life. As you know, we love our food when we travel and we buy a lot of it. In Iceland in particular, food is expensive and supermarkets are few and far between. It is, therefore, necessary to be able to rely on a good fridge to keep your food not only cold but food-safe as well. Being in a cold climate doesn’t change this. Our Waeco fridge was doomed from the start. With a bad smell and failing to function, it took having to throw out the entire contents of our cooler to finally say I’d had enough. We made contact with CampEasy to report the problem. To their absolute credit, their customer service, support, and ultimate solution were outstanding. On a public holiday in Iceland, a representative of CampEasy made contact with us and organised a brand new cooler to be flown (yes flown!) to an airport nearby where we were staying. Problems happen when you’re on the road, and things like equipment breaking down cannot be foreseen nor controlled. It is always the way in which your service provider responds that will either see you recommending them or otherwise. I have no hesitation whatsoever in recommending CampEasy as a result of their customer service. Luckily, we had some cold nights, so the food got put outside and the beers got cooled down with ice from beached icebergs! Only in Iceland right? As well as the storage under the seats, there is also storage in the rear. We had one large hard suitcase that we kept in the cabin underneath the table and we were able to fit one hard case cabin bag and one soft in the back. The best way to return your vehicle is in the same condition it was when you first drive it away. Returning a vehicle without damage makes for an efficient exit. It also makes for an inexpensive one. We always look after our hired vehicles as if they were our own, returning them in a clean condition. In Iceland, there is self-serve cleaning equipment at some of the major service stations. Driving around Iceland can get very dusty, so being able to clean it up a little before you return it also helps. All vehicles should be returned with a full tank of petrol. Remember, it’s like Russian roulette to drive a rental vehicle in Iceland without sufficient insurance coverage. When we returned our vehicle (in perfect condition), we witnessed another group being handed an expensive damage bill. They were all trying to work out who actually had insurance, how they would pay, whether they had enough room on their credit card for the charge etc. We got to stay in some incredible locations all because we chose to do our trip in a campervan. The freedom, flexibility, and independence this method of travel affords us is why we do it over and over again. As our accommodation, our transport and often our restaurant, it also allows us to save money. Nowhere has this been more important or more obvious than in Iceland. Pro tip: If there was one recommendation I could make for hiring a campervan in Iceland, it would be this. Get insurance and get as much as you can afford. Be sure to check your own travel insurance and know what you are covered for. Iceland is also one of those countries where changeable weather conditions can impact your vehicle and failing to have the appropriate insurance could mean a very nasty surprise for you at the end of the hire period. Would we recommend driving around Iceland in a campervan? Of course, we would. I would also recommend Car Rentals in Iceland as your one stop shop for all types of car rental, not just campervans. The cost of hiring is obviously more expensive in their high season (June – August). Whilst it is cheaper during the shoulder or low seasons, consideration should be given to the general weather conditions, the ease of driving and amount of daylight. Whilst many will attest to driving in winter without issue, some might find this is stress they don’t need to endure. We rented in June and as such the driving conditions were excellent. With daylight conditions all day round, we could extend our driving time later into the night than we usually would. We were able to secure a fantastic rate for our campervan hire. We paid AUD$1636 for eight days hire and AUD$419 for petrol. At AUD$256 per day for two people, this represents excellent value when compared with hotel costs. When you are looking for which company to use, look for the one that is going to give you the best campervan rental in Iceland. Know what you want, have all of this advice in your head, and look for the campervan that will suit what you want to do. Iceland is one of the best countries in the world to do a road trip. With the Ring Road that circumnavigates the entire country, what better way is there to see it. Hire a campervan, hit the road, and let your hearts and minds lead the way. These tiny fishing villages are usually missed when visitors only come to see the main highlights of Iceland. Follow our itinerary around the east coast of Iceland for some beautiful locations. The north of Iceland has a striking contrast of incredible waterfalls and geo-thermal landscapes. Visit Akureyri, Iceland's second largest city and one of the prettiest you will find here. Previous Post: « Self guided walking tour Reykjavik, Iceland. Do it yourself and save money! This is THE ultimate guide to Iceland in a campervan. I am bookmarking this blog! We never really rented a campervan and yet I’m very curious about it. Just like you, we thought it’d be the best option to save some money in Iceland, which is particularly expensive and yet offers great views. Only we didn’t know how to properly go about it. I am going to save this article because it’s *very* useful and covers all the info a newbie like me, and because you’ve been very honest about everything, which I appreciated a lot! I honestly would have never thought of renting a camper van. Even with the good review (minus the fridge), I cannot see us doing it. Central heat and warm baths are too much a part of my modern, pampered life! I noticed a tube of Vegemite in a photo. I thought it was only in Australia! This is the way we would like to see Iceland. I had some friends recommend just renting a car and sleeping in the seats for a self guided tour but that just didn’t sound like fun. A camper van sounds like a lot of fun. Going with a tour bus insures that you’ll always have crowds around you and only go where the bus stops. I would like to have more options on our trip. That’s amazing they flew a new fridge to a nearby airport. That is customer service! I like the idea of a camper van as it allows you to be doing more of our own thing while out on the road. Iceland has been on my list for a long time and I will be considering this when we go. Inbuilt van wife is indeed super useful! I don’t really do campervan because we always did just regular tent camping with my parents and these days we travel more in Asia and I don’t think camper vans are a good idea in places like India. I love the way you have set-up your camper van and a roadtrip through Iceland sounds like a dream come true. We did a two week trip to Iceland a few summers ago and loved driving around the country, but didn’t even think about getting a campervan but can totally see how liberating it would be to do that. And I am in complete agreement, that one judges a supplier not by nothing ever going wrong, but by how well they handle when something does! It’s amazing the space you actually get inside one of those converted van campers! I’ve only ever stayed in a traditional static caravan, but I’ve always wanted to have a go at living on the road – and this would be a great way to explore Iceland too. And i’m totally with you on needing 4×4 – the roads up there can be brutal! Travelling in a campervan is a dream of mine yet to be realised! Iceland definitely seems to be the perfect place to give it a shot. This one looks spacious enough and it even has a mini cooking space! What fun! Making a note of CampEasy for future reference. Iceland is a place with landscapes that are out of this world. Taking in the beautiful sights of this country while travelling in a campervan is definitely a great experience. Campeasy looks to be a great option for renting out a campervan. I really liked your detailed and candid review. It was nice to see the company responding even on a public holiday and flying in a replacement cooler. That speaks volumes of the service of the company. Loved your very easy to follow instructions for using the campervan to get around Iceland. I am shocked to hear that they all come with WiFi. I would not have guessed that. Thanks for sharing your awesome tips. When renting a campervan in Iceland, DON’T, EVER, USE CAMPERVAN ICELAND! This company is not even in Iceland! They don’t know anything about the country. We rent a “cute motorhome” through what we later discovered as being a booking company, and not a rental company. We choose this small motorhome in January 2018, for a travel planed from 8 to 30 September 2018. So, we just came back from Iceland. We were told, a week before our departure, that we would not be allowed to drive on gravel roads… We are not talking about “F roads”. But gravel roads are everywhere, in Iceland, even a few parts of the Ring Road are gravel roads! After a lot of emails exchanged with several different people from Campervan Iceland, we had another answer finally saying “no problem, you can drive on gravel roads”. All the people answering to this question, and a few others, had spanish names… None had icelandic names. We also discovered at that time, that no insurance would cover damages occuring under the vehicle, and that the complementary insurances we paid for “gravel and ashes”, would only cover damages occuring to the glasses… Tyres and underbody would not be covered by the very expensive insurances that we had decided to take for this purpose, knowing that icelandic roads are very often gravel ones! Reading what they sent to us, we realized that they did not know Iceland at all!!! There, we were asked to wait for 20-30 minutes for a shuttle, which had to drive us to the rental company… We’ve been waiting for about an hour. Then, finally arriving at Europcar’s other counter, not situated at Keflavik airport, we met some very kind people, but discovered that our “BRAND NEW cute small motorhome for 2 people, less than 6 meters long”, was finally a not recent, very big motorhome, for eight people, about 8 meters long and more than 3 meters high! As we insisted on the fact that it was very important for us to get a SMALL vehicle, neither long, or high, Europcar told us that they had none of them, never! They were only renting big vehicles, for 6-8 people, and the smaller one they had was a 7 meters long Knauss. We then choose to take this too long vehicle, not being at all the campervan we had booked 9 months ago. CAMPERVAN ICELAND IS VERY OFTEN LYING TO HIS CUSTOMERS! We also wanted to be able to park our campervan in small villages. Getting a 7 meters long and 2.32 m wide motorhome, we, several times, had to renounce to visit some places, not finding a parking suitable for our too big motorhome. Hopefully! Because, when washing our teeth at night, we get a feet shower at the same time! It was impossible to use the bathroom… So, the next morning, we drove back to Europcar, and asked for another vehicle, as the bathroom had several minor and important problems, and that we discovered that a lot of other things, like the blinds, were either completly broken, or not functionning properly. But, they had no other vehicle to be rent… So, we had to wait all the morning long, in order to have the motrohome partially repaired, and to be able to, finally, leave Keflavik’s region. And what did Campervan Iceland for us having all these troubles? NOTHING AT ALL. Even worse! When a woman at Europcar called them asking why they choose Europcar for us, as our contract mentioned a small campervan, and not a big motorhome, Campervan Iceland told the woman that they sent us an email, a few days before, informing us that the booked campervan was not available and that we would get a bigger one… As several times previously, this was JUST A LIE! We never, ever, received an email about that, but we even had the proof that they sent us an email, 3 days before our departure, confirming that we would get a small campervan, no worry about that! Hi I’m sorry you had that experience. I understand the requirement for a small vehicle in Iceland, that’s why we chose a camper. With insurance, the devil is always in the detail. We’ve been renting motorhomes and campervans all over Europe for 20 years and there has never been a company that will insure the undercarriage or the top of a vehicle. This is because this is where renters do the most damage. This company you mention is not someone we have used and can only confirm the experience we had was indeed a very good one, from pickup to dsrop off and everything in between.